Happy Monday! I hope you had a great weekend. My weekend wasn't super exciting, but I was able to knock quite a few things off my to-do list. I submitted a proposal for the Oklahoma Council of Teachers of Mathematics Summer Conference. I haven't presented at a conference in several years, so I'm excited about the opportunity! 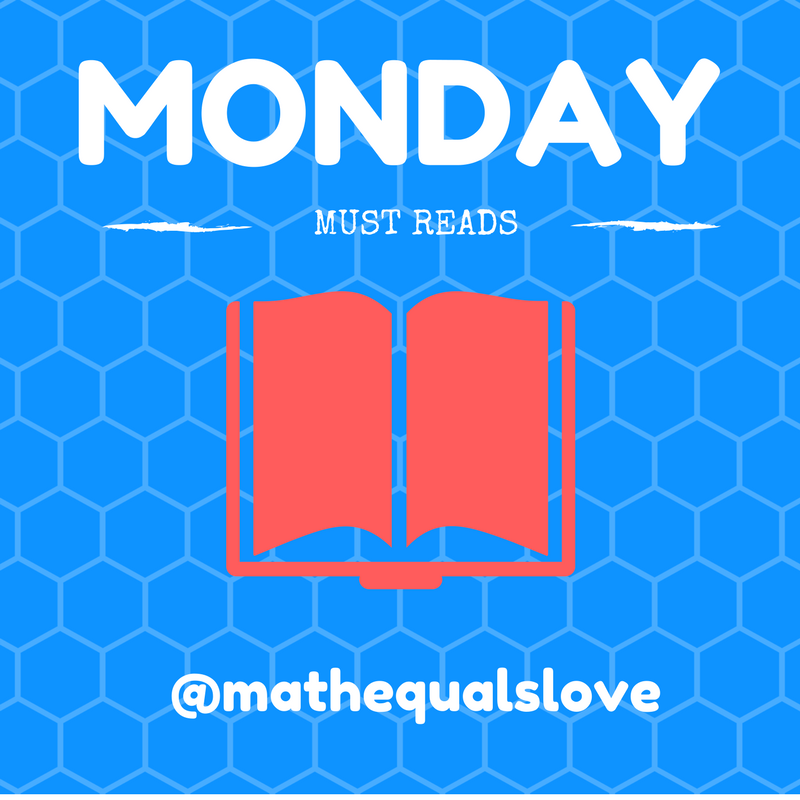 I'm also excited to share this week's volume of Monday Must Reads. This is a regular series where I share great ideas I have ran across recently on twitter and in the blogs I subscribe to. Mr. Knowles has been doing some awesome work with creating rich tasks that address sequences. I've used several of Andy Lutwyche's awesome spider-style activities in my classroom over the past few years. I was excited to see that he has shared a new spider activity for venn diagrams! You can download Andy's files on TES. Jennifer Williams shares an intriguing idea for how to get students reflecting on their learning after receiving their graded tests back. I gave up chapter/unit tests for only individual SBG skill quizzes several years ago, but this post has me thinking about possibilities for next year! Preparing to celebrate the 100th Day of School? Jennifer shares a creative idea for celebrating that involves having students create 100 problems for their classmates to solve. I love this display from TIBHS that features famous mathematicians from around the world. Here's another display that caught my eye on Twitter from Park Junior School. I would like to extend this project to give students a task to draw Christmas ornaments based on the circumference, area, radius, or diameter. Ms. Johnston shares some awesome geometric valentines her students created last year. Another great idea from Ms. Johnston: Have students use dice to model how many boxes of cereal one would have to buy to collect all 6 prizes. Coach Lombo shares a fun way to celebrate e Day. Amy McNabb took a different but equally appropriate approach to celebrating e Day with foods that begin with e.
Now that e Day is over, it's time to start prepping for Pi Day. Here's a Pi Day Sudoku Puzzle shared by Cliff Pickover. Denis Sheeran shares another idea for celebrating Pi Day that involves a circle drawing contest. Check out all the details here. Looking for some interesting data to use with your students? I highly recommend checking out the NBA Math Twitter Account. Tveen Jatabachian shares a great idea for using painters tape on desks to practice measuring angles. I love the idea of having students rotate through stations around the classroom. Looking to promote student creativity and decorate the walls of your classroom a bit more? Gateways Classics suggests creating a "Graffiti Wall." Looking to improve group conversations and discussions in your classroom? Check out this idea of mapping conversations from Nicole Bolduc. I love this example of real-world experimental probability from Anne Wagenaar. Paul Jorgens combines several awesome things into one: factoring polynomials, open middle problem structure, and Desmos. Paul shares another factoring puzzle with a missing coefficient. I love how the Olympics brings out creativity in so many different classrooms. I especially love the idea of Olympic Sock Speed Skating from Lisa Rode! Mrs. Jane Pontes has also got in the Olympic spirit by having her 7th graders host a Barbie Math Olympics. L Hamiter poses an interesting question. What do these three equations have in common? If geometry is more your thing, check out this awesome area puzzle from L Hamiter! Susan Pienta is making me want to go back and redo my entire unit on scatter plots just so I can include this activity. Amanda Schweissguth shares some awesome student work. I love that students had to color-code their artwork by angle type. It's no secret that I love dry erase templates. So, I was super excited when I saw Lin W created a dry erase template for naming ionic compounds in chemistry. Want to use up some of your students' energy and collect some real-world data for rate of change at the same time? Check out this idea from Sarah Clooney. Also from Sarah Clooney: An awesome activity for systems of equations involving riddles and cups of coins. Professor Smudge shares an equation-solving task that has students apply what they know from one equation to another. Eric Zuercher has produced a function machine that tells me I need to up my function machine game! Taylor Grant shares what is, in my opinion, the most creative Which One Doesn't Belong? puzzle ever. Mr. Zummo offers a great idea for teaching trend lines when creating scatter plots. I never would have thought of using string as the line of best fit! Elissa Miller shares a great idea for using patty paper in geometry. Have some deer antlers around? They make the perfect manipulative for practicing adding fractions. This creative idea comes from Kelsey Brown. Lisa Broadbent shares an idea for getting students up and moving around the classroom while translating between words and equations. Lori Breyfogle shares a great question to pose to your students. My students the other day had no problem when we arrived at 5 = 13 as the answer to a question, so I'm curious how my own students (in high school) would respond. Ann Arden retweets a copy of a movie poster where the math is ALL wrong. How would your students interpret this solution mathematically? David Sladkey shares a fun-looking puzzle. David also shares an interesting post about his "Eraser Ban." David also shares a fun, fall-themed puzzle. You could easily change the theme to this puzzle for use any time of year, though. 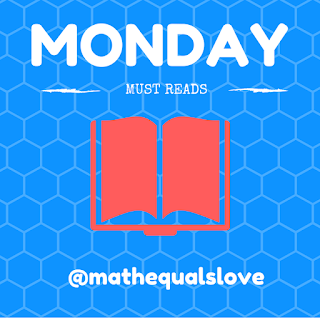 How would your students fare with this estimation challenge that is also from David Sladkey? Rachael WS suggests giving your students this puzzle to make them think outside the box. I'm super-inspired by this find the error task from Jae Ess. I need to do more error analysis with my students! Until next week, keep up the awesome idea sharing! I have a Learning Celebration after every test. We review questiosn, reflect and revise for half the class period. The other half is board games that involve math, strategy or logic. Tsuro is their favorite. My first celebration I had balloons, streamers and brought in treats.